“The Roots of Cool” is an old phrase, that in surfing, pretty much sums up where we all came from. It’s a place where characters, events and locations combine to shape who we are and what we do in the oceans of the world. I didn’t make the phrase up or purport to have coined such a cool (no pun intended) saying. I’ve always liked it and use it to identify those people and situations I think, well, are cool! San Diego’s Tom Threinen is one of those characters. Mat rider, artist, and all-round good guy, Tom’s surf and mat roots go as deep as any of us today. His knowledge and understanding of the oceans ways are uncanny, his credentials and history solid and artwork original and unparalleled. Threinen started surfing in Orange County, California in 1963. His family soon moved to Virginia Beach, Virginia where Tom continued to stay stoked and surfed as often as he could during his formative years. All the while he was drawing, painting and sketching. Tom was becoming an artist. By the early 70’s, Threinen was back in San Diego as a young man, attending San Diego State University, as a fine art major, and surfing his brains out at the myriad of mysto reefs in the Sunset Cliffs area. He supported himself by glassing and airbrushing for a local underground shaper, Mike Sheffer and his Fresh Fish Surfboard label. 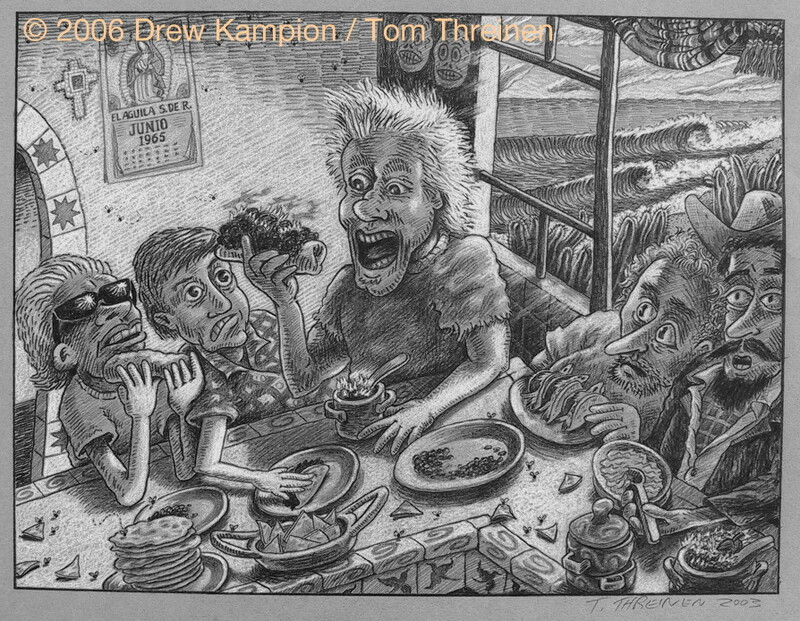 In 1974 Threinen became the Staff Artist at Surfing Magazine in Capistrano Beach until 1978. It was there that he met and worked directly with longtime friend Barry Berg and Editor, Drew Kampion. Tom contributed to, and worked on many a project and monthly magazine, including Kampion’s original Don Redondo satirical short story series... It was Tom who gave Drew’s characters Don Redondo and Careless Constipeda their faces. He still does it today. After the late 70’s Tom turned to freelancing as an artist and has been very successful at it all these years. Today, Threinen rides his mat whenever possible. And when he is not near an ocean he turns his thrill-seeking dials towards flying and sailing (read on to find out more), both of which are worthy substitutes for the increased adrenaline factor and stoke mode. And you won’t find a SUP in his quiver. Well, I for one look forward to seeing it. Here is a conversation Tom recently shared with us. Tom - The first mat I owned was a Converse-Hodgman (stripes across model), in the mid 1970s. George Greenough inspired me, of course. But with no Internet and no other mat surfers to communicate with, I never figured out how to ride the thing. In the early 80s that mat vanished from my life without me even noticing. In early 2007 I paddled out on my first modern surf mat, a “standard” 4th Gear Flyer with cotton canvas glued to the deck. UKMS - You were an integral part of the Dale Solomonson tribute book, "Spirit Matters." In fact your painting graced the cover of the book. How did that all come about? Tom - I was invited by some Washington State mat riders to participate. Pete (chiledub) asked me to contribute something to a tribute book he and his friend Bagjuan were making to send to Dale to cheer him up after medical surgery. It was reading Dale's many contributions to the Swaylock’s discussion site that convinced me I wanted a mat, and I wanted Dale to know that. The full color drawing that I sent to Pete was picked for the cover. UKMS - How did you come to know Dale in the first place? Tom - I just knew about him from what I read on the Internet, mainly the Swaylock’s site, www.swaylocks.com. UKMS - The Dale, Spirit Matters piece was exceptional. Have you done many other mat oriented pieces? Tom - I have a small collection of mat drawings that I have digitally colored, like the Dale cover. UKMS - Tell us about your mat artwork. Tom - I often daydream about matting. It's hard to capture in photographs the real business of riding a mat. It's a common experience to be having the best ride of your life and your buddy paddling out on his mat, watching you, may not even be aware of it. I'm not sure if a drawing can do it any better than a photograph, but I'm trying to make visible the mat riding experience. UKMS - How much of your current art has a mat theme? Very little, but I want to do some new work. If I ever have the time, a short animated mat surfing video would be fun to make. UKMS - How would “YOU” define yourself as an artist? Tom - I enjoy making fine art, drawings mostly, though I will make a painting from time to time. But I’ve always been a cartoonist. I’m very sensitive to the physical materials used to make pictures. I resisted giving digital art a try because there weren’t any materials. The picture existed on a computer screen or was just a boring printout. But my attitude changed when Drew Kampion and I collaborated on the comic strip version of "The Teachings of Don Redondo" for The Surfer's Path magazine. I had to learn the digital art medium to produce the artwork. Now I'm a stoked digital artist. UKMS - Does Don Redondo ride a mat? Tom - Good question. 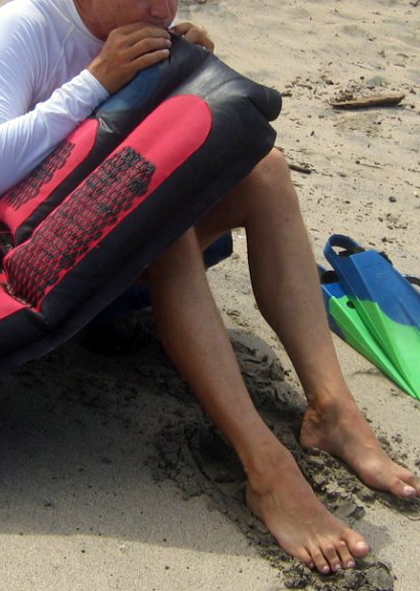 Although Don himself has never mentioned riding a surf mat, I think he does. The episode of “The Teachings of Don Redondo” published in the November 1979 issue of Surfing Magazine features Careless Constipeda in 1968 tripping out on Don’s mat and going over the falls on a 12 ft. wave. 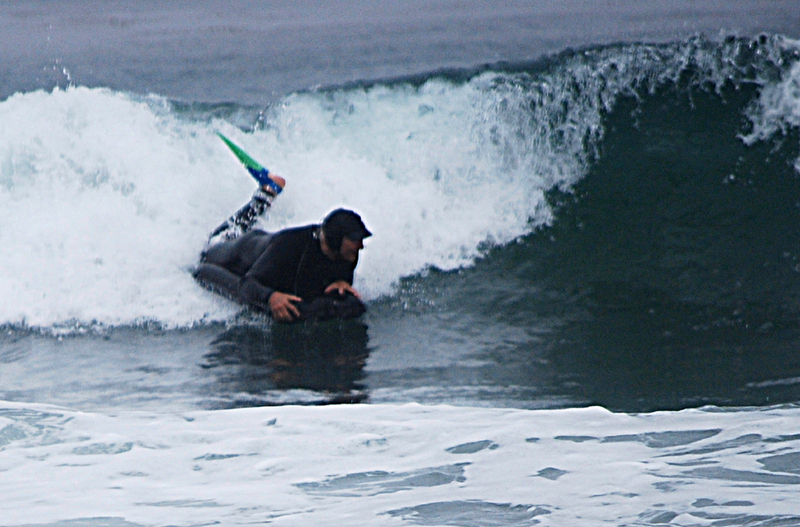 Don Redondo is a Waterman, so if Don owns a mat he must ride a mat. My Hodgman mat was the model for Don’s mat in the illustration I made for that story. Don Redondo is on Facebook, so ask him about mats. UKMS - Besides Drew Kampion's story of Don Redondo what do you draw on for artwork? Tom - Things I see around me everyday. Most commonly buildings, plants, waves, small objects, landscapes and very often faces. Over the years I’ve done many fine art portrait drawings and even more cartoon faces. Right now I’m drawing portraits on my iPhone. UKMS - When did you first start surfing? Tom - In 1963 when I was 13. My family had just moved to Huntington Beach, a mile or so from the Santa Ana River Jetties. My dad and his partner were leaders in the new fiberglass boat building industry, starting Columbia Yacht Corporation that year. Foss Foam was blowing “pop-out” surfboard blanks next door to my dad’s factory in Costa Mesa. At the beginning of the summer of 1963 he brought home a 9’ Foss Foam pintail, glassed by one of his boat workers. That summer I rode my bike every day to the Jetties hauling that crude, heavy surfboard behind me on a homemade trailer. I still remember the first wave I caught at the Jetties. UKMS - After all the years of riding waves how did the mat come into your Vision? Tom - The stage was set when I was living in Ocean Beach, San Diego.It’s 1969 and shortboards and the backyard surfboard making movement had just come into being. I made a few experimental shortboards for myself, but almost immediately I cut my obsolete longboard in half and shaped a 5’ kneeboard from the foam. I made some flextail kneeboards, egg type kneeboards and then a series of small fishes. My favorite kneeboard was a 4’6” fish with knee wells shaped into the deck. In 1986 I left the beach to start a business with my dad in Henderson, Nevada, next door to Las Vegas. I had an opportunity to build a business in a booming economy and I went for it. I never thought I would be surfing again. But how does someone like me (a surfer to my core) quit surfing? You don't really, but if you don't have something to fill that intellectual and physical void, life feels somewhat empty. So I bought a beat up 28 ft. trailer-able fiberglass sailboat and set about customizing it to suit me. I gutted the tacky interior and rebuilt it in a traditional nautical style. I set up the boat's sails and rigging for single-handed sailing. Lake Mead, the reservoir behind Hoover Dam, is notorious for strong winds. It was just 15 minutes from my office. My setup was to slip out of my business when the wind was really blowing, and within 20 minutes I would be flying across the water at top hull speed. Sailing my boat in strong winds was to me like drawing long fast lines on a fish kneeboard. Later I started flying a “trike”, a motorized flex-wing weight-shift ultralight aircraft (that resembles a large tricycle), over the open desert. I got into this pastime when one of the properties we owned, in the desert south of Las Vegas, needed a tenant. My dad found an operator of an ultralight airpark that was being forced to move due to encroaching housing developments. So we rented our empty 26,000 ft. industrial building to "Hawk" Wyatt. One day Hawk put a helmet on my head, strapped me into his 2-seat trainer ultralight, and took me for a ride. I thought, "Hey, this isn't so bad"! A few months later I soloed, and became a pilot. An ultralight pilot doesn't need a license, but they are prohibited from flying a 2-seat aircraft, or flying over buildings. Essentially, you are on your own up there in the sky. Just don't endanger anybody else. I consciously made sailing and flying acceptable substitutes for ocean wave riding. I kept a close watch on the local winds and the cycle of storms passing through my area and would sail in the strong afternoon winds or fly over the desert in the calm of the early morning. In 2006 I sold my business and found myself “retired” at age 56. My wife, Terry and I, own a home in San Diego, and now I could live there full time and go ride some waves again. I tried riding my old kneeboard, but it didn't click with me and the hard board wasn't as comfortable as I remembered it to be. It occurred to me that I could get a new Hodgman surf mat. So I Googled “surf mat” to find out where they were sold. I found out the Hodgman mat was history, but I was one of PG’s first customers when he announced his 4th Gear Flyer mat was back in production. 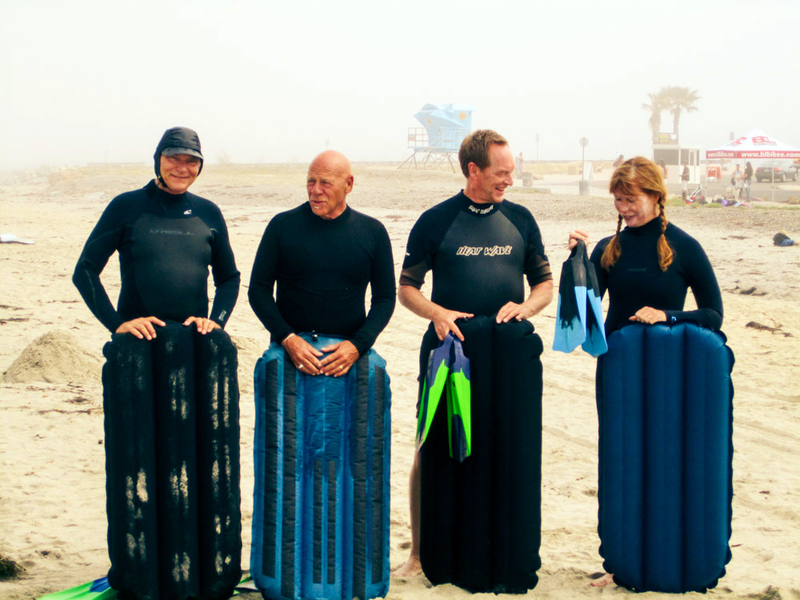 The transition from surfboards to a sailboat to an ultralight aircraft led me ultimately to the surf mat. UKMS - What inspires you to only ride a mat after everything else you ridden and been around? Tom - The surf mat seems to combine sensations from surfing, sailing and flying. Racing across a long wall on my mat I can recall long straight runs across Lake Mead, my boat heeled over hard and delicately balanced between the pressure of the wind on the sails and the counterweight of the lead keel.The mat senses the wave energy like the sail feels the wind. Controlling a mat is like adjusting the trike wing in flight to ride on invisible waves of thermals, eddies, wind shear and other disturbances in the air. You turn a trike by shifting your weight, causing the wing to tilt, flex and change shape. As with a mat, it takes a sensitive touch to fly a trike. Mat surfing to me has an interesting mental aspect to it. There is always more to learn about riding a mat. I often paddle back out thinking stuff like “What did my mat just do on that last wave? What happened through that section when I didn't think I was going to make it? Why did I get that burst of speed?” Paul's new Omni seems to not even be there under you. Yet, at the same time it knows what to do on each wave. I like to think about the mystery of how this shape-changing and finless surfcraft works. On top of all that, because a mat works on any kind of wave I get to surf more on the uncrowded small and stormy days. Tom - Oh yeah! It's hopeless with non-surfers. When a standup surfer talks to me in the water, they get it that mats are fun, but they only understand the obvious: the mat is soft, it goes fast, and it just LOOKS easy and fun.UKMS - Where do you surf mostly? Tom - The reefs of South San Diego. UKMS - Have you traveled much to ride mats? Tom - Nosara, in Costa Rica and the Portuguese coast near Lisbon. UKMS - How has mat surfing changed your ocean life? Tom - I’m 63, and didn’t surf for 20 years. Standup surfing--and the longboard I would likely have to ride--would limit me to easy, boring waves. And kneeboarding just doesn't interest me. On a mat I am able to charge challenging waves, and I know, for many years to come. The other thing is, I'm really stoked at how often I get to surf in uncrowded waves. That's the best change mat surfing has made in my surfing life. I can have a fun session in ugly wind swells or waves too small to attract anybody else. I can even surf in the Ocean Beach swimming area in the summer (ha-ha). (Editor’s note: This spot is known to be a quality summer beach break but off limits to anyone other then mats, boogies, and bodysurfing). Tom - I'll continue to develop my skills and keep my fitness level up. I plan to make some more mat surfing art. UKMS - What is your go-to mat currently? Tom - The 4GF Omni. Tom - I’m currently riding an Omni, a Tracker Round tail and sometimes a Fatty. My original standard is still in my quiver because it has the thin fabric deck. UKMS - How often do you go to other mats to try them? Tom - A friend gave me a Neumatic MT5. I was riding that in small waves, but the new Omni works just as well. I don’t often get a chance to try other mats. Tom - 90 degree bend more or less. Usually one adjustment in the water will fine-tune my mat to the waves and the water temperature of that day. Where I usually surf the higher tides are the less crowded times. I put a little more air in my mat to be able to catch the rolling swells earlier. UKMS - What fins are you using and why? Tom - Duck Feet. They have good drive but they don’t feel like bricks. Tom - I don’t really need to. I have a pair of DaFin fins. They are comfortable but don’t push me as well as Duck Feet. I bought a pair of UDTs once, but sent them back without even surfing with them. They are just too big and clumsy for me. UKMS - What type fins did you use as a knee boarder in the 70's? Were they better or worse then what you use now and why? Tom - Churchill Fins. I loved those fins because they felt like a natural extension of my feet. But when I tried them with my first mat, they were obviously too small and weak. UKMS - You had kneeboards made by San Diego’s Stevie Lis. How well did you know him? Tom - I only had one board shaped by Steve Lis. I didn't know him well at all. I went to his shaping room one time and he generously sold me the shaped blank he had just finished for himself. UKMS - Which board did you donate to the Surfing Heritage and Culture Center and why? UKMS - What is your fantasy mat wave? Tom - Chicama in Peru is a fantasy mat wave, and I hope to go there some day. But Skeleton Bay in Africa is my ultimate fantasy spot. How fast could a mat get going there? Check out this video (below). UKMS - Any memorable sessions and/or experiences you’d like to share and where were they? Tom - The finishing touch to my initial learning curve on the mat came in Costa Rica. Through Drew Kampion's connections we traded 2 free weeks at a beach resort for our "Surfer's Path" series of Don Redondo comics. 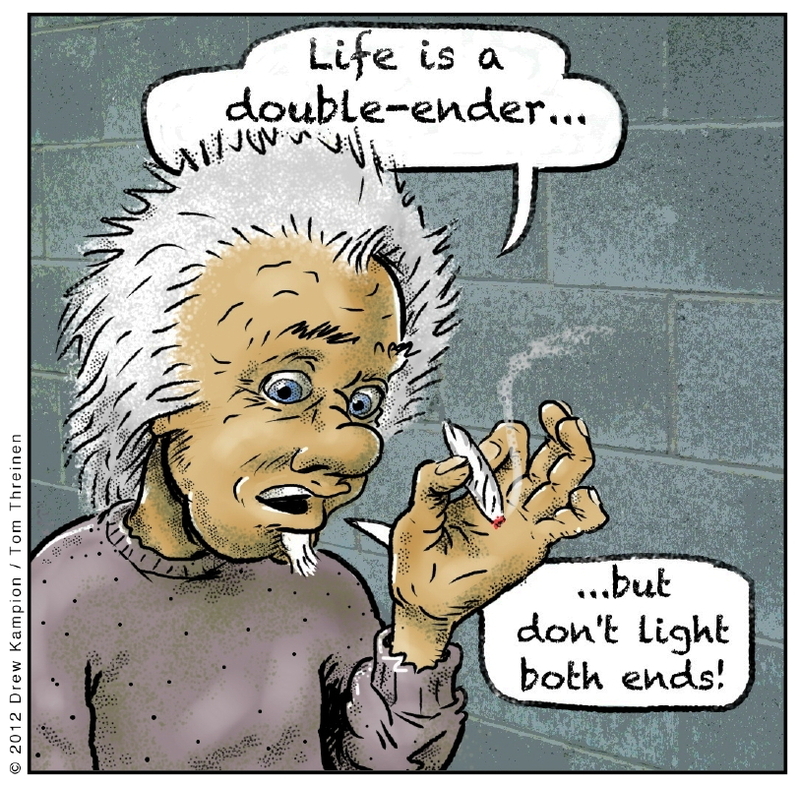 The comic strip ran in the local paper. I had no idea what the surf was like in Nosara. I just knew the water was warm and I would walk to the beach and surf. Turns out it's a beach break facing the wide-open ocean. Paddling a mat out through lines of whitewater was going to be an ordeal. The first time out, in some sizable surf, I found out the waves were moving fast out of deep water. They were sensitive to the tide, changing during a session from thick and hard breaking to thick mushy rollers. They didn't nicely peel off down a reef either, but had big chunks of the lip coming down that were hard to get around. Nothing like San Diego surf, and I didn't know how to ride my mat on them. So in two weeks I figured out some new things. Like how to duck dive the mat. And taking off without dropping in, just riding the high line to build speed. And getting around sections by carefully timed drops from the high line track, followed by some kind of speed run the mat can do down at the base of the whitewater you're trying to get around. I really moved to a new level on that trip. UKMS - Tom, many thanks for taking the time to share your stories and amazing artwork with us.